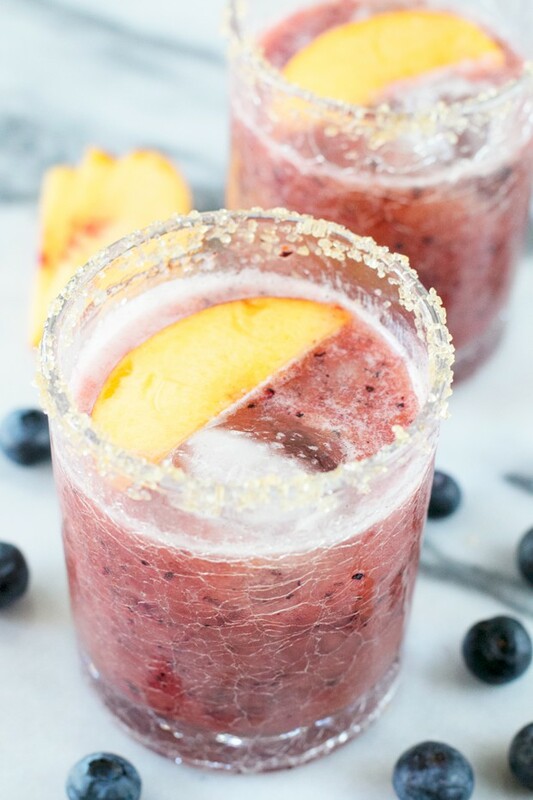 Blending up a Peach Blueberry Margarita is the best way to take advantage of peach season! 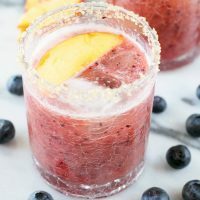 Blueberry is the perfect fruity tart pairing to bring out all the best flavors of those delicious peaches. 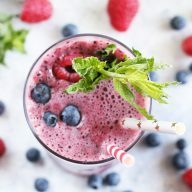 I am putting all the fresh fruit in my cocktails! It’s peach season and since I’m lucky enough to be in Colorado, that means one thing… Palisade peaches. The best peaches you will ever eat in your life are Palisade peaches. They are sweet, ripe and the juice literally drips down your arm after you take that first luscious bite. I love any food that makes a mess when I eat it so I always end up buying way too many peaches. Then I end up delving into a deep panic when I realize they are going to go bad sooner than I expected. Instead of making five million peach pies and tarts this year, I’m using up my peaches in my cocktails. I’ve needed these peach cocktails to make it through some pretty hellish weeks lately. I can’t lie, I’ve been in a bit of a funk. A little too much stress and a little too many things in flux for my taste. Clients have been changing up their needs and I’m desperately trying to keep up. It’ll all settle down soon, but when you are already going through some changes in your everyday life, having those random client curveballs thrown at you really takes it out of you. I am just starting to climb out of it, but man, I could use a serious break. Thankfully I’m heading out of town next week for some serious R&R. I just need to be out of the kitchen and back in the real world for some more inspiration, to be honest. I’m way too drained and I’m even getting bored with my “new” cooking/writing ideas. That’s when you know the funk is real bad. 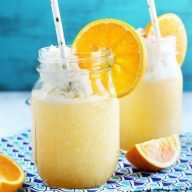 Before my vacay, you can bet your sweet lil’ butts that I’ll be kicking back with these margaritas until I’ve used up all my peaches. Well this drink and this galette that I made a while back. 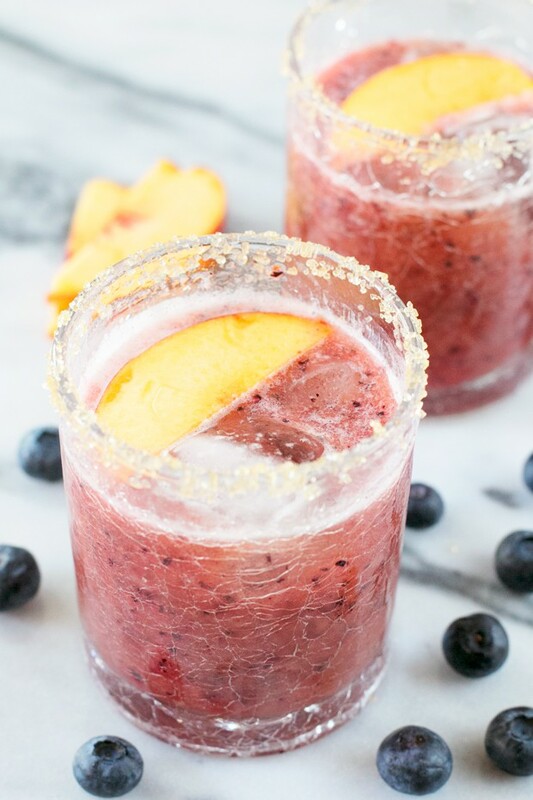 Blueberries and peaches really do need to run away together and live happily ever after. Peaches and blueberries make this margarita just the right blend of fruity and tart. 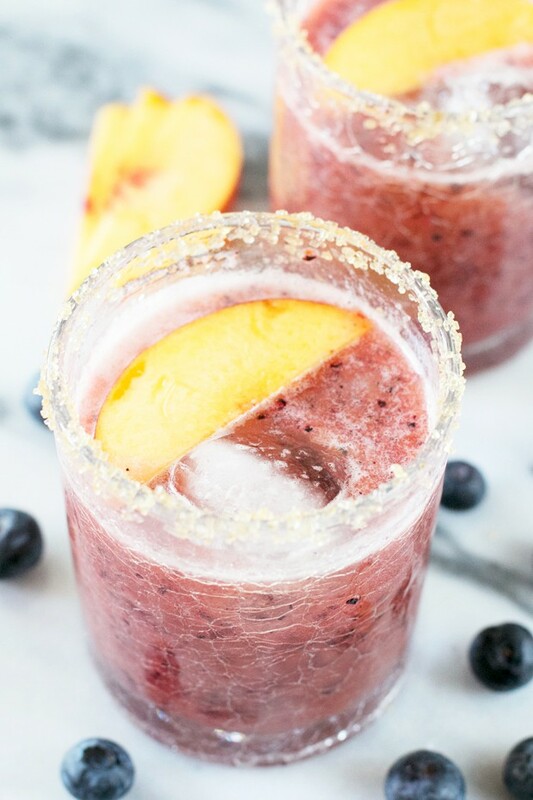 To make the peach blueberry puree, add peach and blueberries to a blender. Puree until smooth. 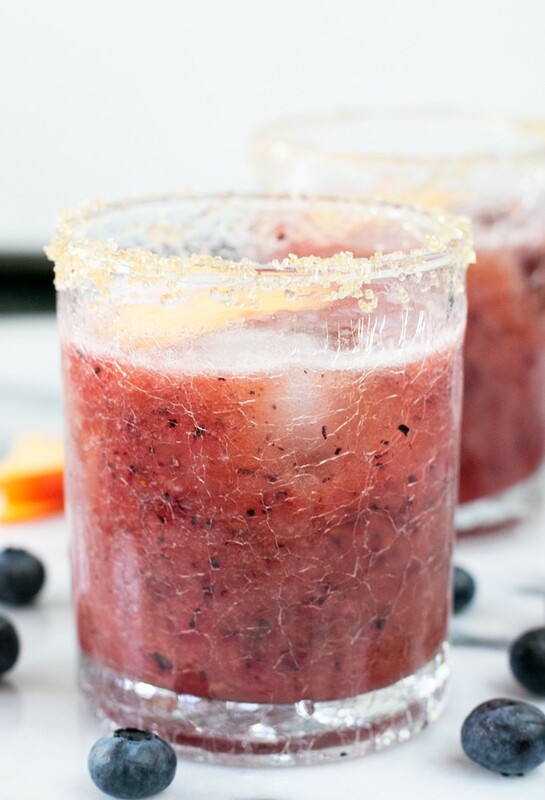 To make the margarita, shake peach blueberry puree, tequila, lime juice and agave together in a shaker. Rim two glasses with turbinado sugar and fill halfway with ice. Divide the margaritas evenly between the two glasses. 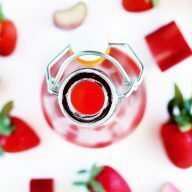 Such a delicious refreshing Summer drink!